→ How to exchange GSC TownMap Tiles ?? How to exchange GSC TownMap Tiles ?? Can you help me ??? I saw townmap graphics pokemon christmas ,, I hope to do well. I see the tool "Gsc Townmap Editor" and within the existing tiles image with .bmp format. I've been a little change and edit townmap, but after I opened my rom hack and saw townmap it turns tiles ,, it has not changed one bit! Can you explain in detail how? I tried to enter it through agixp tiles, but I do not know the offset. Re: How to exchange GSC TownMap Tiles ?? You use Tile Layer Pro to edit town map graphics. I'll look up the offset when I'm on my computer. What is the offset ? I will look it up when I'm on my computer. I'm on my phone right now. Ok, the offset for the Town Map graphics is 0xF8C94. So, open your rom in Tile Layer Pro, and at the top click on "Edit" then "Goto". That will pop up a window. Type in F8C94 in the box labeled "Offset" and click "Go!" Now you can see how things are supposed to look, and you can edit them more easily. You can edit them from inside TLP and make sure to save the rom when you are done. Then, you will need to export a copy of that image to use with the Town Map editor. It doesn't load the image from the rom, so you'll need to give it a copy of your new image so it will show the town map right (but not in color, unless you take the time to manually recolor each time yourself). Right-click on the top left corner of the image, then (while still holding down right-click) drag the mouse over to the bottom right corner (to the O in Kanto) to select the whole image. With the image selected, you can go to "Edit" then "Export Bitmap" and choose where to save it. 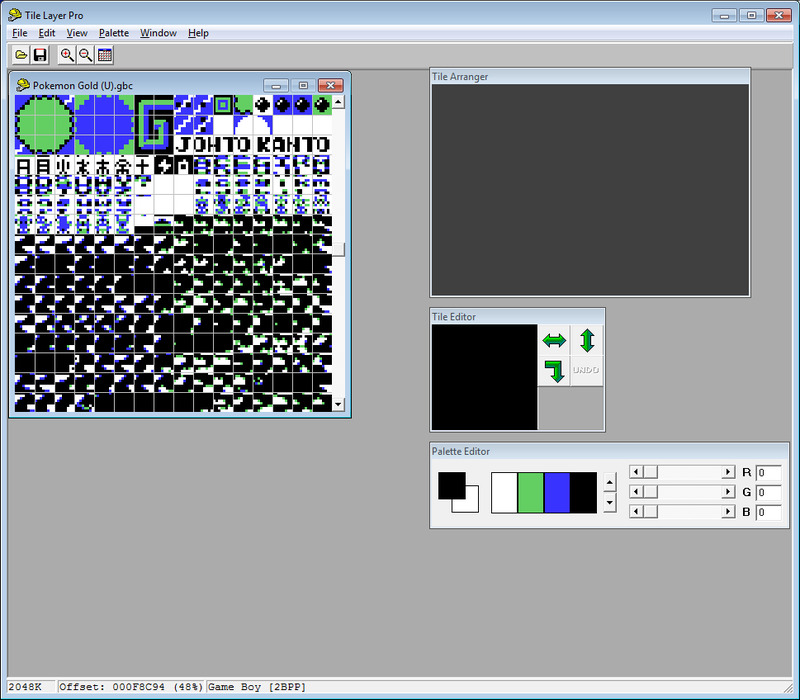 That gets a copy of the image out of the rom and into a normal picture file so you can load it in the town map editor. Now, you aren't quite done yet. Open the picture you exported in Paint, and press Ctrl + W to bring up the "resize image" menu. You'll need to resize it to 200% because that is the size that the Town Map editor uses. 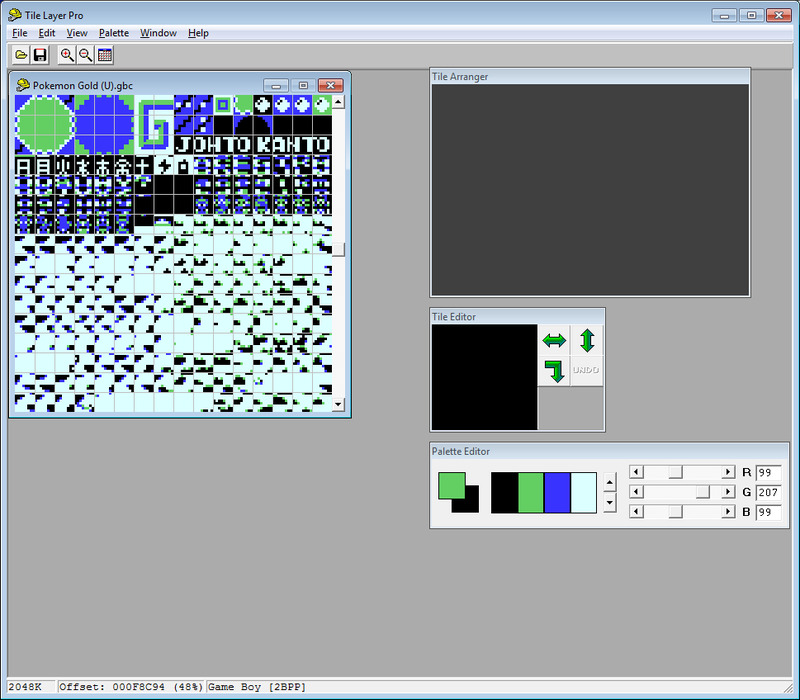 Then just save it as "tileset.bmp" and you can replace the image that came with the Town Map editor. I can add screenshots for the later steps too if you need me to. Hopefully this helps though. I can try to help explain it to you, but I really don't have time to just start inserting things for people. I have my own hacks I'm working on, plus I'm back in school working on a second degree, among other things. If I start just doing things for you, I'll have to do them for everyone, and I just won't be able to. So I'll be happy to try and help explain what went wrong and help you fix it, but I can't just start having people send me their roms and me insert things for them. So, you said you tried to follow the tutorial, but it didn't work. What happened exactly when you tried it? Try to be specific. Did the rom crash? Did the game load, but the titlescreen didn't load the new graphics? Did it load the new tiles, but the picture looked wrong? That sort of thing. Okey, if u cant do it. The "easier method" is extremely simple, or it would be if the link wasn't dead for the titlescreen image it tells you to insert. I'll find that image on my computer, upload it again, and try to make the tutorial easier to understand. I didn't ask you to upload anything. I said I was going to upload a file so people could use it. Although, now that I actually looked at the title screen you want to use, I can tell you that the "easier method" will not work with that one. I'd actually have to look more closely at it to see if that titlescreen will work at all, it might have too many individual tiles. (Yes, I know it is the same size as the gameboy's screen, but it might use more individual tiles than you can use, since the original title screens re-use a lot of the tiles multiple times for the background). So I guess I will go look at the tutorial for the more complicated method and see if I can explain that one better, since that is the only way you'll be able to use that title screen you want. What is the compatible method for my hack ? That is the one you will have to use. But I'm sure I will need to re-write that tutorial to have it make sense to anyone. I made that thread years ago, and basically just copy/pasted a badly written tutorial by someone else, and tried to make it halfway readable. Okay, thank u. I'm sorry im new hacker, i have much problem... I want to add gender selection, but i dont know how ? I think you need to come back to that once you know more about the basics, otherwise it will just confuse you.